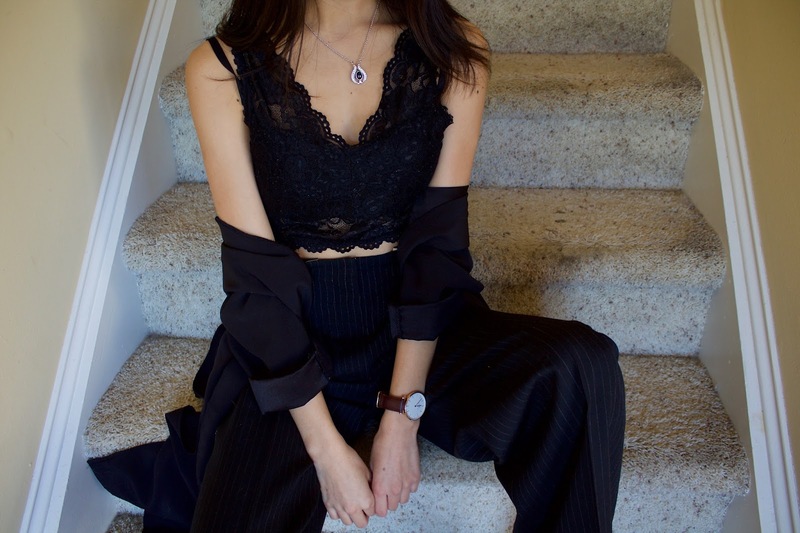 Today’s all black outfit features these amazing Rag & Bone pants I found for $4 at Goodwill! Although, I had to get them hemmed, it was still one of my best thrift finds yet. What other way to wear them than with an all black outfit? I thought the pinstripes and lace were a perfect combo. 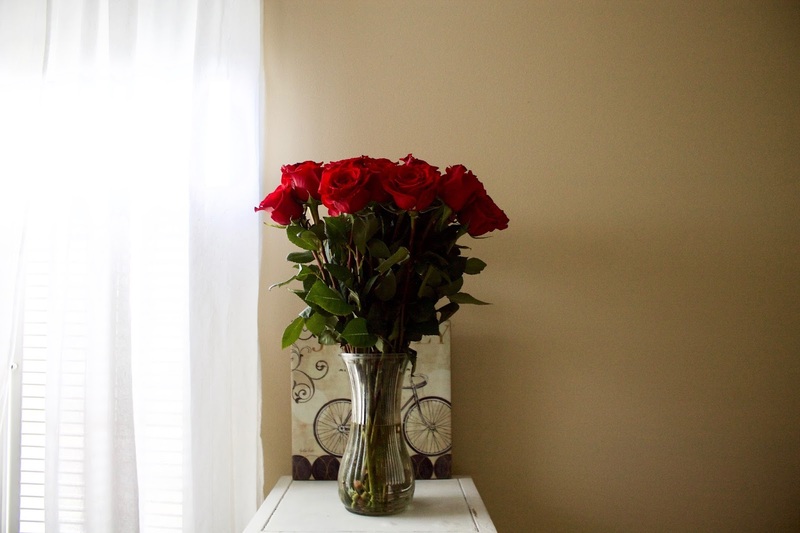 Also, I threw in a photo of the roses my boyfriend gave me! He’s the cutest. It’s actually the first time someone has ever given my flowers (took him long enough, lol jk). I hope everyone has a great week as we move into the last month of 2016! I and also my friends happened to be examining the excellent helpful tips on your web blog and all of the sudden developed a horrible feeling I had not expressed respect to the blog owner for them. All of the boys were definitely for this reason passionate to study them and already have without a doubt been having fun with them. Appreciation for actually being considerably helpful as well as for selecting such amazing resources millions of individuals are really eager to understand about. My very own honest apologies for not expressing appreciation to earlier. Appreciating the hard work you put into the site and thorough material you provide. It is wonderful to discover a website once in a while that isn’t the same outdated re-written stuff. Fantastic read! I have saved your site and I am adding your RSS feeds to my own showbox app download for android page. I absolutely love your site and find many of the content to be exactly I am trying to find. Would you offer guest writers to post articles for you? I wouldn’t mind publishing a story relating to vshare pro download or maybe on many of the topics you’re posting about here. Great page! Howdy! This is my very first reply on your website so I just wanted to say a quick hello and say I really enjoy reading through your blog posts. Can you recommend any other sites which go over real estate news? I am also truly fascinated by that! Thanks! Hi, you are definitely correct. I frequently read through your posts attentively. I am likewise looking into best home intercom system, perhaps you might write about this sometimes. See ya. After examine a number of of the weblog posts on your website now, and I really like your manner of blogging. I bookmarked it to my bookmark website listing and will likely be checking back soon. Pls take a look at my website as effectively and let me know what you think. Hi there, what do you feel around wifi router access? Really trendy issue, isn’t it? Howdy I’m so excited I discovered your web page, I really discovered you by accident, while I was searching on Bing for best instagram followers app. Nonetheless I’m here right now and would just enjoy to say many thanks for a wonderful blog post and the all around enjoyable blog (I furthermore adore the design), I do not have enough time to look over it entirely at the moment though I have book-marked it and moreover added in the RSS feed, so when I have the time I will be returning to look over a lot more. Please do maintain the wonderful work.